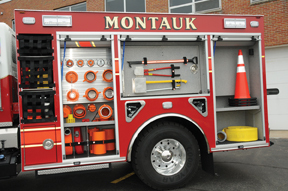 Welcome to the June edition of the Montauk Fire Department Corner. I trust everyone is enjoying the spring weather and is getting ready for the summer rush that has already begun. 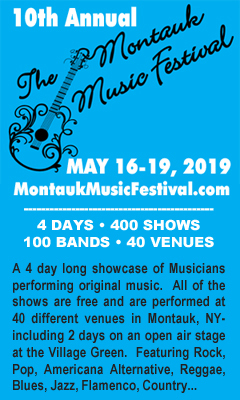 I know that the men and women of the Montauk Fire Department are ready, as always, to protect and to serve our citizens, and the visitors to our community. You, the public, can assist us by being vigilant and cautious while driving, and by keeping aware of your surroundings. When you hear sirens and see lights from emergency vehicles, please slow down and pull over. Thank you. As I mentioned in last month’s edition, May was the start of brush fire season. The Montauk Fire Department’s training for May was centered on the fighting of brush fires. We conducted training at the Suffolk County Park at Third House on Tuesday, May 29th. Unfortunately we had to go to press prior to the drill, but the photographs will be in next month’s MFD Corner. 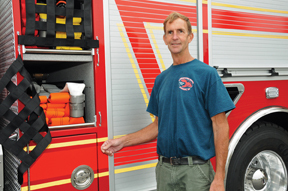 There was exciting news for the MFD’s Water & Hose Co. No. 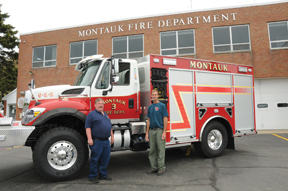 3 in May, as the Montauk Fire Department took possession of a brand new Hose Truck, replacing the old “9-3-3”. 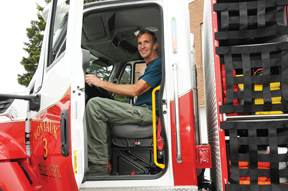 It is a four-wheel drive International truck that can accommodate 4,000 feet of hose, can pump 1,500 gallons of water per minute, and has a 750 gallon water tank on board. It is a major upgrade to our fleet of equipment, and will be ready soon for Captain Robert Gosman and the men and women of Co. 3 to begin training on it. 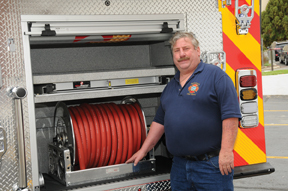 Please enjoy the photographs provided here by Honorary Chief Rich Lewin. 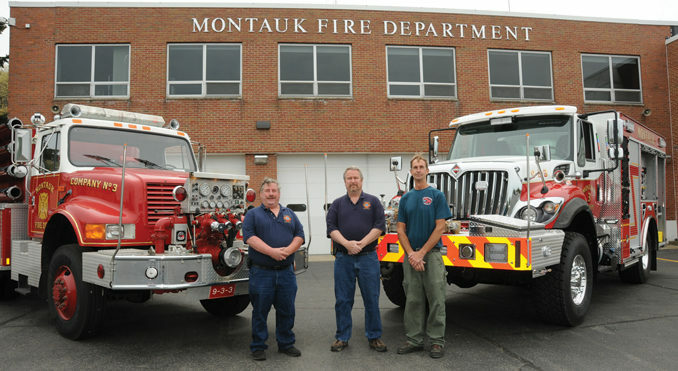 I hope you enjoyed this month’s Montauk Fire Department Corner. I look forward to bringing you more information about the Department next month.